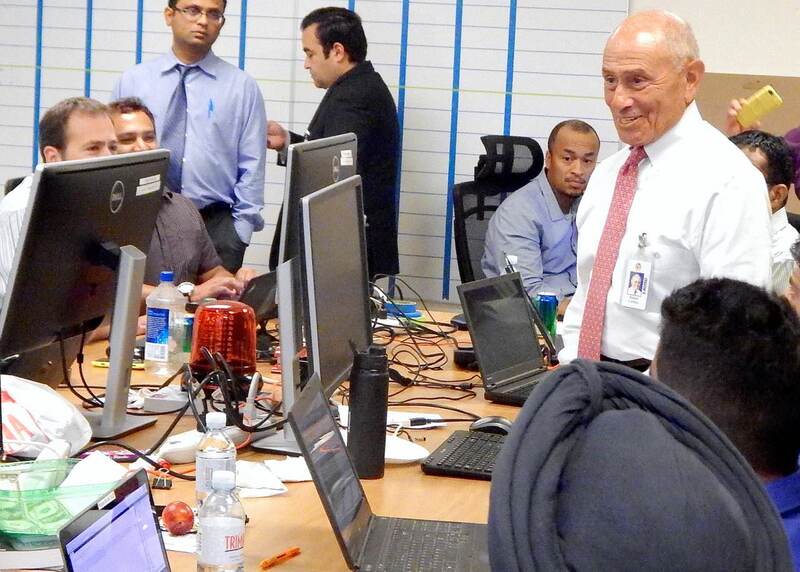 LAUSD Superintendent Ramon Cortines visits the MiSiS control center at the start of the school year. As he reaches what may be his final weeks with the district, LA Unified Superintendent Ramon Cortines sent a message Friday to all employees, congratulating the district personnel who have helped make improvements to MiSiS. “I am extremely proud of everyone who has been involved in this important work during the past 12 months,” Cortines said, according to LAUSD Daily, a district communications website. The message comes just a little over a year after Cortines took over the district for a third time and made fixing the troubled system a priority after it crashed computers and caused scheduling troubles, transcript backlogs and other problems. One year later, the MiSiS system is performing well and no major issues have arisen in the new school year. A big cornerstone of fixing MiSiS was asking the school board and Bond Oversight Committee for more money. The initial tab for MiSiS ballooned from $25 million to $133 million after Diane Pappas, who was appointed by Cortines last October to lead the MiSiS improvement effort, made a pitch to the Bond Oversight Committee in May asking for approval for more money. Cortines praised Pappas in his message. Pappas applauded the MiSiS team for its work. MiSiS remains short of fully functional to the level as was originally intended. The extra bond money approved in May was intended to help fixing the system by the end of next year, Pappas told the Bond Oversight Committee. For now, MiSiS leaders are saying the big problems appear to be behind them.